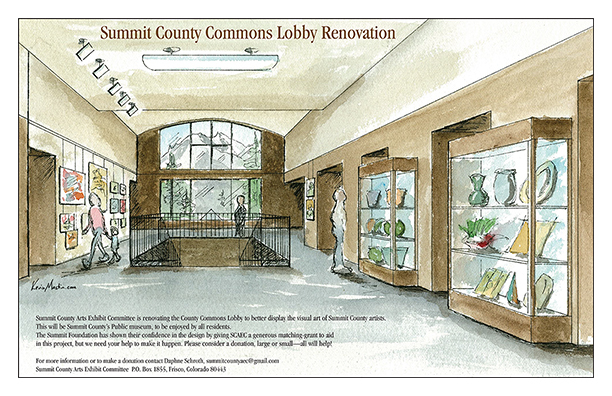 The Summit County Arts Exhibit Committee (SCAEC) is preparing to upgrade the exhibit space in the Summit County Commons in Frisco. 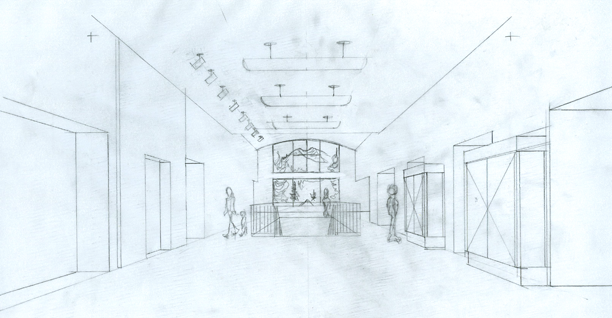 They asked me to sketch an “after” picture to show what they envision. I certainly didn’t have to work hard to make the “before” look homely. 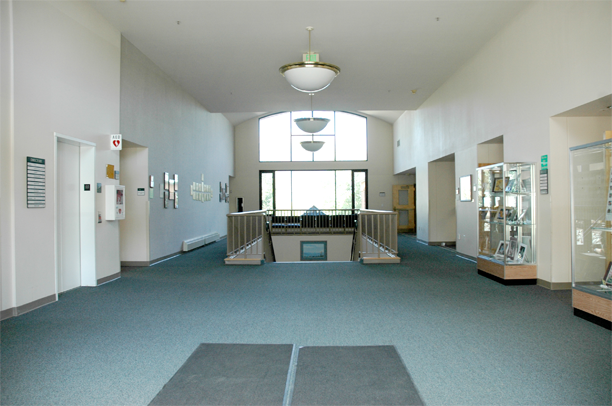 The first thing to address is to relocate or eliminate all the “wall litter”: misplaced directory signage, room numbers, etc. 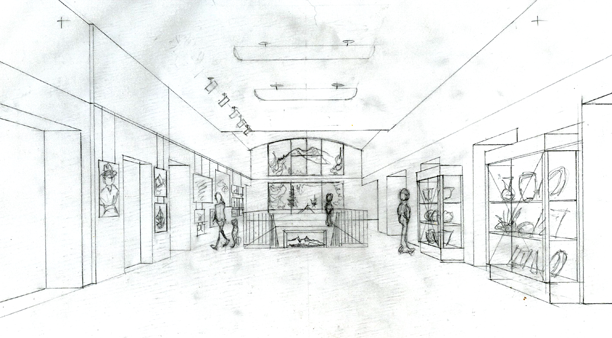 I drafted a quick one-point perspective sketch to show cleaner walls, different light fixtures hanging tighter to the ceiling revealing more of the picture windows, and upgraded glass cases. I added some track-hangers for the artwork and put some of my friend John Hudnut’s glass into the display cases. Time to add some color. We chose a couple color swatches and decided where to make the paint breaks. At this point I like to scan in my pencil sketch and use PhotoShop to drop in color; it’s pretty quick and very easy to change colors. 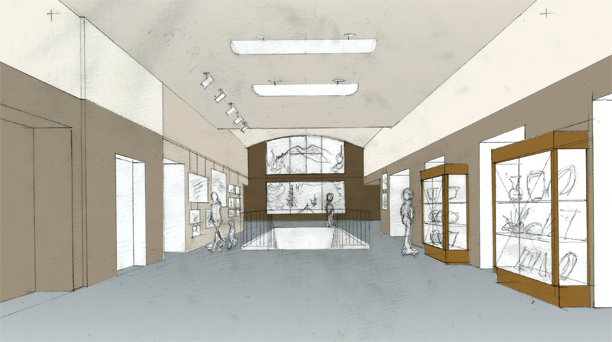 Now that the sketch and plan is approved it’s time to paint—the best part of every project. The hardest phase (of even the smallest project) is the planning, communication, and goal-setting with the client. Once this is done the, actual artwork is fun. 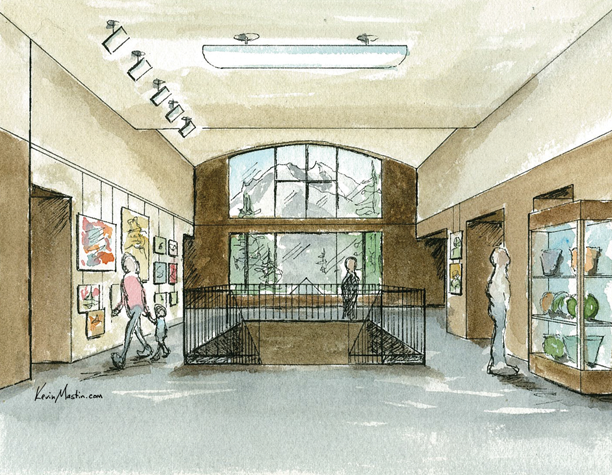 With this type of illustration I will typically paint in watercolor—it is very fast, it is inexpensive and it maintains a sketch-feel, which is appropriate for a proposal or a “work-in-progress.” You’ll notice that I paint a lot of extra space: left, right, top and bottom. This will give us flexibility when it comes time to printing and cropping for different purposes. Here is a tighter crop of the most critical part of the painting. To me, this type of artwork defines “Commercial Art,” it is art to sell a product or idea.